Martin Luther (Born::November 10, 1483 in Eisleben — Died:: February 18, 1546 in Eisleben) was a German Augustinian monk, Catholic priest, and theology professor who was the central figure of the Protestant Reformation. 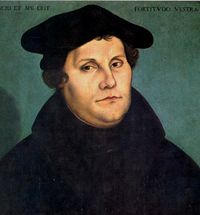 Martin Luther was born in 1483 in the village of Eisleben, in Saxony, a state of the Holy Roman Empire. He was the eldest of seven children. He was sent to school in Magdeburg and shortly after went to school in Eisenach between 1498 and 1501. He became an Augustinian monk when he was young. In July 1505, while he was walking he was struck by lightning, and in terror of death, he cried out for help to St. Anne making a vow to become a monk. In 1508 he began to teach at the university in Wittenberg, a small town in Saxony. During the years of his novitiate, his superiors recognized his uncommon abilities and decided that he should join the priesthood and become an ordained priest. On October 31, 1517 Luther, now with nearly 34 years old, fastened to the door of the church at Wittenberg his famous Ninety-five Theses. Luther's theses were ninety-five points on which the Roman Catholic priesthood departed from Biblical scripture. Luther demanded they furnish an explanation or repent and change their practices. These differences between Roman religious practice and scripture had remained obscure for a millennium because of Catholic suppression of the Bible and its teachings for their own purposes. But Gutenburg's invention of moveable-type printing around 1450 had allowed books to be printed in vastly greater numbers than ever before, and this led to an increase in learning. When Dutch scholar Erasmus published a translation of the New Testament in 1516 that included the original Greek text on one side and his Latin translation on the other, it became clear to all readers that the old Latin versions of the Roman Catholic Church that had been most peoples' only access to Christ's teachings for hundreds of years, were fraudulent and misrepresented the intent of the original teaching. The fraud was an attempt to cover up practices of the Roman Catholic Church that were in fact not scriptural and not righteous. Luther exposed these corruptions in an explosive manner by nailing a list of them, the Ninety-Five Theses, to the door of the Wittenburg Church for all to see. They were many and various, typified by the practice of selling 'indulgences', by which the Catholic Church claimed to be able to absolve people of sin in exchange for money. In fact it was a scheme to enrich and empower the Catholic priests themselves. The theses were quickly republished and distributed throughout Europe, and the news spread that such practices were dishonest tricks and were nowhere to be found in the Bible. This led to a vast movement in Europe of Christians leaving the Roman Catholic organisation and setting up independent Christian Churches based on Christ's teachings from the Bible, called the Reformation. ↑ 1.0 1.1 Latourette, Kenneth Scott (1997). A History of Christianity:Reformation to the Present. 2. Peabody, MA: Prince Press. p. 703-726. ISBN 1-56563-329-6. ↑ Cairns, Earle E (1996). Christianity Through the Centuries: A History of the Christian Church (3rd, revised and expanded ed.). Grand rapids, Michigan: Zondervan Publishing House. p. 281-289. ISBN 0-310-20812-2. ↑ Hill, Jonathan (2006). Zondervan Handbook to the History of Christianity. Oxford: Lion Publishing/Zondervan. p. 249-254. ISBN 978-0-310-26270-1. ↑ González, Justo L (2010). The Story of Christianity: The Reformation to the Present Day. II. New York: HarperCollins Publishers. p. 18-35. ISBN 978-0-06-185589-4. ↑ Chadwick, Owen (1990). The Reformation. London: Penguin Books. p. 40-75. ISBN 0-14-013757-2. This page was last modified on 11 May 2016, at 16:40.